All sizes of cutting root equally well. They are all made with a slanting cut at the base and a straight cut at the top to make insertion into the ground easier and distinguish top from bottom!! They are also very easy to plant and can simply be pushed into loose cultivated soil and firmed in. They will need no support. In firmer soils simply make a vertical slit with a spade and push the cutting to the bottom of the slit and firm well by treading. Alternatively a narrow hole may be made with a bar or spike and the cutting pushed to the bottom and firmed well. A mole-plough or subsoil blade may be pulled through the ground in rows and the cuttings simply pushed into the loosened soil slit and firmed in by foot. 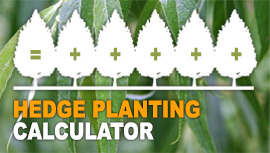 The smallest 30 cm (1 ft) cuttings must be planted so that only 5 cm (2 inches) is showing above ground. This makes them vulnerable to being smothered by weeds and grass before they get away, and so they are only suited to situations where they will receive a high standard of care in the early days. 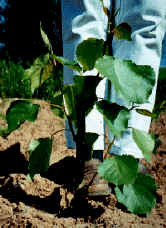 The 60 cm (2 ft) cuttings are planted so that half is in the soil as in the photo below. This means that the new growth starts above weed and grass height. Being larger they also contain greater reserves of energy and grow away faster. 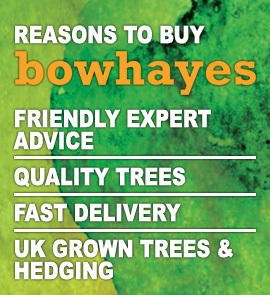 In most situations the 60 cm long (2 ft) cuttings are the best option and will produce a tree, if looked after, of 180-240 cm (6-8 ft) high in the first growing season. 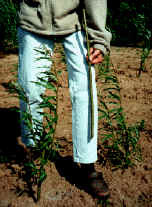 A 60 cm long (2 ft) Willow cutting before planting and examples 8 weeks after planting. On dry sites such as sands and gravels, or on banks, we would suggest that you plant a longer cutting and insert a larger proportion into the soil. Both the Hybrid Willows and Poplars have the ability to make roots from any part of the stem and so, if planted deeply, will produce deep roots which will always find moisture. As stated earlier the Unrooted Hybrid Willows & Poplars will produce a tree of 180-240 cm (6-8 ft) high within the first season if kept fairly weed free. 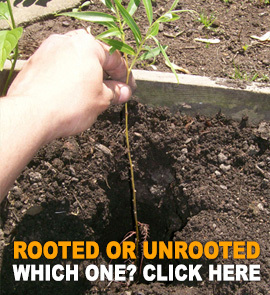 The rooted trees will give you almost instant results. They are available bare-rooted up to 240 cm (8 feet) high. They will, however, require a hole to be dug of approximately 25 cm wide by 40 cm deep (9 inches wide by 15 inches deep) and the support of a cane or stake until they are established. We always suggest that the rooted willows are pruned back to knee height after planting to avoid the need to stake them and make them grow bushier. It is worth repeating that for easy planting and economy the 60 cm long (2 ft) cuttings are the best option in most circumstances. The rooted trees and longer cuttings will cope better with difficult conditions and weed or grass competition to give instantly visible results. On arrival you should try to plant your trees or cuttings as soon as possible but, if the weather or time makes this impossible, your cuttings will remain viable somewhere cold for 4 weeks. A cold shed or outside is fine but if the weather turns warm then put them into a fridge. If you are unable to plant the rooted trees within ten days of arrival then we suggest that you unpack the bale and cover the roots with soil in a shallow trench to keep them moist.